EAs are briefed about the imminent demolition of a Palestinian farmhouse. 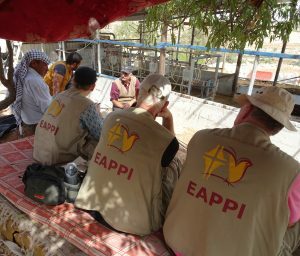 Organised by the Quakers in Britain and supported by the World Council of Churches, Ecumenical Accompaniment Programme in Palestine and Israel (EAPPI) volunteers serve for three months in either the Palestinian Territories or in Israel proper, providing the local Arab population with protection as a result of their presence as impartial observers. Volunteers, known as Ecumenical Accompaniers or EAs, monitor human rights abuses, provide support to Israeli and Palestinian peace activists and act as advocates for an end to the Israeli military occupation of Palestinian lands. Participation is open to “people of all faiths and none” and EAs receive a living allowance and payments for expenses, plus a range of benefits. EAs are helped to get a real understanding of the situation in Israel and Palestine as they have first-hand meetings with people affected by the conflict. The Israeli peace activists with whom they will be working include Rabbis for Human Rights, New Profile, Yesh Din and Combatants for Peace. EAs will also get to go on tours with the Israeli Committee against House Demolitions, Quaker Voluntary Action (QVA), the Alternative Tourism Group and Zaytoun, which organises ‘Harvest Tours’ and ‘Taste of Palestine’ visits. EAs are expected to keep an eyewitness blog to highlight particular issues and to open up contacts with their local TDs and MEPs to make them aware of ongoing problems faced by the people of Gaza, the West Bank and Israel. A total of 20 EAs from Britain and Ireland are currently being recruited to serve in Palestine and Israel next year. Relevant information is available here and applications can be made online, with Wednesday 25 April the closing date for applications. Applicants will have to reveal personal details in questionnaires about their health and fitness and about security issues. As well as agreeing to spend three months in the Holy Land, EAs are expected to be advocates for peace in their home country and to commit to at least ten speaking engagements following their return from the Middle East.